One protester and several law enforcement officials were injured during heavily-policed protests against the newly-elected Conservative government outside the Houses of Parliament in Westminster. “No more f**king Tory cuts!” and “Tories – scum!” slogans were chanted repeatedly by a crowd of anarchists, left-wingers and Scottish National Party (SNP) supporters. 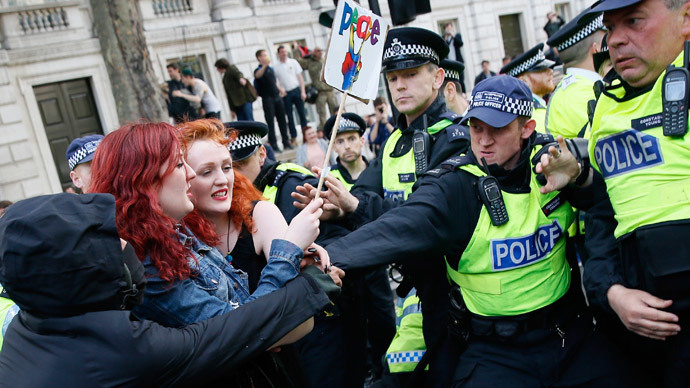 At least 17 people have been arrested following the scuffles, Scotland Yard said. According to the Metropolitan Police, five police officers were injured, and two of them were taken to hospital. There was a heavy security presence, including riot police and officers on horseback. The law enforcement officials “kettled” – or sealed off - segments of the crowd, which they adjudged to contain potential troublemakers. Despite the measures, several isolated clashes took place. "Police in Westminster are currently facilitating an unplanned anti-austerity protest outside Downing Street,” said a statement from the MET Police. A similar protest in Cardiff attracted 200 people, with singer Charlotte Church among the key speakers. The Conservative Party managed to secure an overall majority and a second term for David Cameron in Thursday’s election, improving on their results in 2010. A parallel demonstration by the far-right anti-immigrant English Defence League in the suburb of Walthamstow was outnumbered by anti-fascist counter-protesters, with police having to keep the two groups apart.